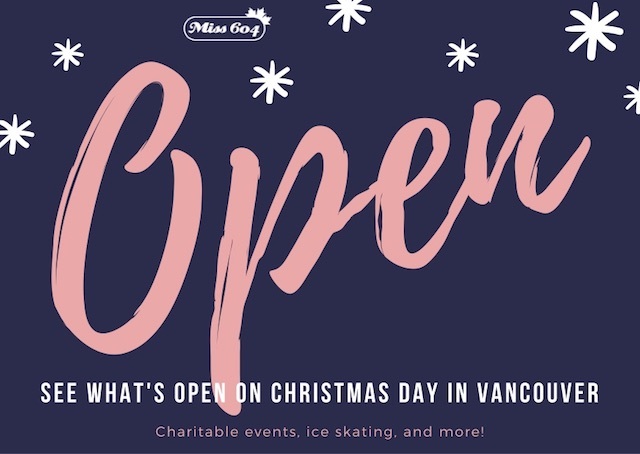 The Robson Square Ice Rink will be open for skating on Christmas Day from 12:00pm to 5:00pm. More ice skating can be enjoyed at Vancouver Parks rinks and arenas, including Trout Lake (12:00pm to 3:00pm) and Kerrisdale (1:30pm to 3:00pm). The Vancouver Aquarium will be open from 11:00am to 4:00pm. Local Mountains: Visit the Peak of Christmas at Grouse Mountain for some mountaintop ice skating, skiing, or snowshoeing. and Cypress will also be open for snowshoe, nordic, and downhill. Light Displays: The free 1.2km trail of href=”http://bit.ly/Lafarge_ParkSpark”>Lights at Lafarge Lake in Coquitlam will turn on as usual at dusk. Also free, the Park & Tilford Hi-Light Festival‘s 150,000 lights on display over 3 acres will be open, along with Christmas at Canada Place along the waterfront in Downtown Vancouver. Charity Events: You can support the The Whalley Santa Cause, or attend the White Spot Christmas Lunch which supports the Richmond Hospital Foundation and Variety – The Children’s Charity. If you have any other events to add, send them in via my contact form and I’ll include them. Thank you! Follow Miss604 on Facebook, Instagram, and Twitter for more event news throughout the year.